Damned if you, damned if you don’t. That was the statement underscoring fashion designers for the Fall 2017 season. In the wake of the 2016 presidential election, all eyes were on the designers to see what political statement they would or would not make. Mike Eckhaus and Zoe Latta, design duo behind Eckhaus Latta, are often politicos—their brand of unconventional textiles and promotion of individualism have embraced gender politics and it has catapulted them to degrees of success unseen hitherto by New York labels; their recent collection wasn’t a response to Donald Trump’s election. Instead, they rethought their design process, asking themselves ‘what is the purpose of their endeavour?’, ‘how can it be developed efficiently?’. Firstly, they made a point of reiterating one of the things they do best: assembling a cast of men and women who aren’t the archetypes we witness on every runway, New York through Paris. This season there was stylist Camille Bidault Waddington, photographer Collier Schorr and performance artist and actress India Salvor Menuez. These creative types are the ones the Eckhaus Latta label encompasses. The show was divided in two parts, one subdued and the other eclectic. The first half was consumed by pewter, slate grey, midnight blue and charcoal; the denouement was defined by tangerines, marigold, raspberries. Perhaps it was representative of the initial fallout post-election, and how we can channel that into something positive. It was an emotional and poetic reply to all that has happened since November. What happens next is on the mind of everyone in this transitional period, where everything is up in the air—to dress for this, the Eckhaus Latta character is dressed in roomy trousers and sharp blazers. Mike and Zoe noted how they wanted to expand and fine-tune their outerwear; they contained some of the experimentalist fluidity that dominated their aesthetic in the first few seasons. This new direction was rooted more in reality, a palpably personal expression of wanting something to be desirable. 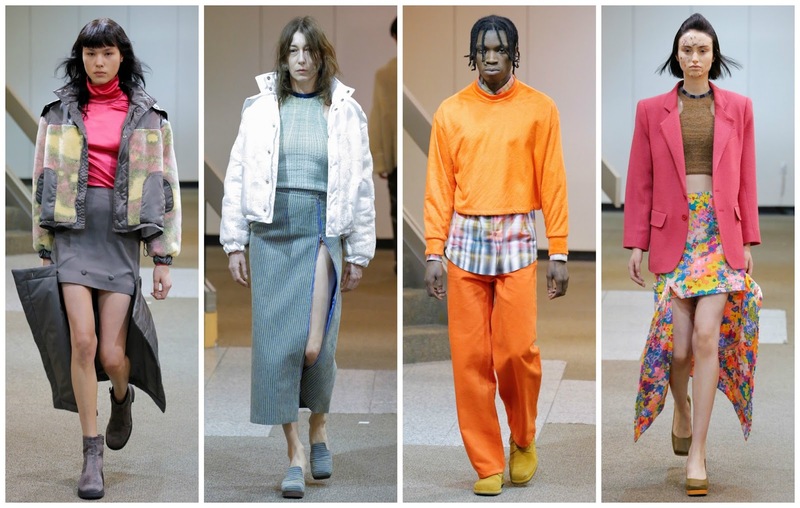 Convincingly, compellingly they rethink what makes Eckhaus Latta the brand it has become. Is it about the politics, as we have all come to expect, only to have those expectations overturned? Is it about the textiles, the strange and the startling? Is it about the diverse casting of different characters that puts many of their contemporaries to shame? Or, is it the emphasis on creating fashion for everyone, not just tall, thin white women that fashion has prioritised for so long? I’d bet on the last one. And in the current climate, that’s a political statement.